Witty and interesting, this movie is creative and funny in the way it handles high school and reflection about life. Me, Early, and the Dying Girl is a good movie. It’s a film that is both intellectually stimulating and also funny. It’s not easy to find a movie about high school kids that is this adult and intelligent about the world. The movie does it by having main characters that think they have things figured out, and aren’t afraid to share their theories and strategies for getting through life. Greg talks to us through voice over and spells out his everyday situation in such a way that you can almost see it making sense. He’s a guy who exists in the background by putting himself right there in the open, talking to everyone, but making sure he is in no way memorable. Here’s a guy who wants to be invisible so he can just be left alone to make his movies (some very funny spoofs on classic films,) with his buddy, Earl. And then a curve ball comes across his path and he finds himself becoming friends with someone he never expected to. All of this makes for a pretty good movie. The kid in question is Greg, a guy who loves to make snarky comments and sly remarks about the other kids in his grade, behind their backs. Greg is the kind of kid who doesn’t take anything seriously. He walks down the halls trying to fit into every conversation without taking the time to actually sit and listen to any of them. Greg isn’t here to learn or to be popular or to make friends. He’s here to laugh about the ridiculousness and absurdity of highschool. At the start of the movie, Greg explains all of this to us. He does it through voice-over monologuing about his theories on life and on high school. He’s got a funny theory about the saying “it was the best of times, it was the worst of times,” and another funny one about the way guys react to and process what girls are saying to them, versus the ways that girls process what guys are saying. Basically the girls are like moose and the guys are like tiny insects being stomped on by the moose. Greg’s life consists of mainly two things, being invisible to the point where he can fit into any crowd, (if he was just the guy who kept to himself, he wouldn’t be invisible, he’d be the weirdo. Being invisible means that nobody really knows or notices him because he slides right in so easily,) and hanging out with his friend, Earl. Greg and Earl have one thing in common… there love of old movies. At least their love of making fun of old movies. It’s not really clear if these guys are actual fans of the films, or just fans of cracking jokes about the films. After all, the one that Greg’s father shows him, which gets him interested, Aguiree: Wrath of God, is so unintentionally comical (especially in the scene that we see,) that Greg and Earl are most definitely laughing about this sort of film together. And the movies that they do make are spoofs. Each one is a spoof on a specific film. Greg and Earl make their own versions. These films often start with a catchy take on the film’s title. So, for example, we get the 400 Bros instead of the 400 Blows, and A Sockwork Orange instead of A Clockwork Orange. We get Senior Citizen Kane, the Seven Seals, and My Dinner With Andre The Giant. And that’s just to name a few. These guys go out and film their own versions of spoofs. It’s a lot like that Jack Black – Mos Def movie, Be Kind Rewind, only here, the movie making idea is just a minor side plot of the film. The main plot is about Greg becoming friends with a girl named Rachel, who has cancer. This all comes about when Greg’s mom, (played by Connie Briton,) and father, (played by Nick Offerman,) approach him with an idea. They want him to go hang out with this poor girl who has cancer. Greg and Rachel are not friends, at the time, but his mother insists that Greg do whatever he can to make her feel a little better, and so he goes. And when Rachel asks him why he’s there, and tells him not to hang out with her because of pity, Greg tells her the truth. He’s there because his mother made him go, and he really needs to hang out with her, just to get his mother off his back. 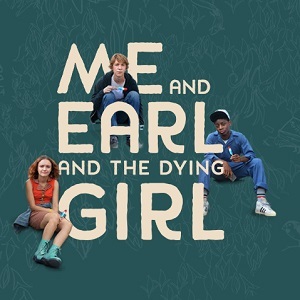 From here, the movie becomes about Greg, Rachel, and sometimes also Earl, hanging out. There isn’t a whole lot to their story until the final acts, and so the movie tries to fill its time by giving us scenes like one where Greg and Earl injest a lot of pot without realizing it, and then get high as kites, while still at school. They believe the pot was in the soup of their history teacher, since they both tried his soup. The sequence is funny, but it does nothing to advance the plot. Moments like this show that the movie doesn’t really have its mid-section worked out perfectly. When it becomes clear that Rachel isn’t doing so well with Chemotherapy treatment, and is thinking about giving it up, the movie takes a dive into serious territory. This is when the plot starts to become pretty interesting, as opposed to the movie putting humor ahead like it did in the first half. Greg and Earl decide to make a movie for Rachel, which mostly consists of them interviewing people who are close to Rachel, about the girl’s life. They go and interview Rachel’s mother, for example (played by Molly Shannon,) and the scene is a lot of fun, as she tries to get the boys to have some wine with her. The movie definitely hits some nice points in its final act, including a conflict between two characters that you never see coming. In a film that is all about living the subdued life of never putting yourself out there, and just existing in the background, its kind of cool to see this transformation journey these characters go on, and how far away they end up getting from where they began. This is definitely a movie where the first act and final act are both great, but its the mid-portions that seem be lacking. Still, the film works mostly because of the characters. Both Greg and Earl are extremely funny. They are both laid back, do whatever they want, kind of guys, who get in over their head with this new friendship. Earl, in particular, is the funniest character in the movie, and yet even he, Mr. all jokes and no worries, allows himself to get emotional as the film goes on. And then there’s Rachel, a character who lets you understand what it must feel like to be in her situation, and why she makes the decisions she does. The acting and characters here are great. The story is pretty good too. It just loses its footing a little bit somewhere in the middle, before recovering strongly for the ending.